Take Gumby and Pokey wherever you go in one of our fun tote bags. These premium heavy duty canvas totes are printed on both sides. Available in three sizes. Have a Gumby Day! Gumby's smile is sure to brighten your day. A great gift item. Show your Gumby spirit at Halloween, a party or anytime. Premium costume. Adult size. Be Gumby! This premium, comfy Gumby costume has been created for children sizes 7-10. The open face allows for greater visibility. Designed for Gumby's grown-up female fans. This sleek, alluring dress fits sizes 4-10. Glittering facial features add a touch of bling. Ties in the back for a perfect fit. 100% polyester. 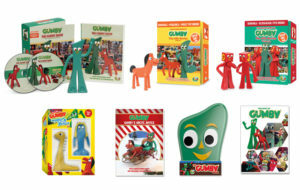 Show your Gumby spirit at Halloween, at a party, a sporting event or anytime. This premium costume is sized for adults. Cycle Gumby style! Show your Gumby spirit and see the smiles as you cruise by in this iconic jersey. The 'Fast Dry Ultra' microfiber will help keep you cool and dry, and the 4-way stretch mesh side panels provide flexibility and comfort. Also in women's sizes. Cycle Gumby style! Show your Gumby spirit and see the smiles as you cruise by in this iconic jersey. The 'Fast Dry Ultra' microfiber will help keep you cool and dry, and the 4-way stretch mesh side panels provide flexibility and comfort. Also available in men's sizes. Remember when your dog chewed your favorite Gumby bendable figure? Now your canine friend can have his or her very own Gumby chew toy which will provide hours of chewing, pulling and fetching fun. Treat your best furry friend to a soft, cuddly Gumby pet toy with an entertaining squeak. 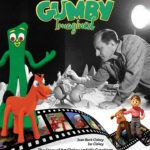 A collection of the most popular and essential Gumby episodes from each of the three decades: 50s, 60s, and 80s. Gumby Fleece Blanket: "Best Friends"
Cuddle up with Gumby and Pokey. This small, lightweight fleece blanket (or throw) makes a great gift. Gumby Fleece Blanket: "Big Face"
Gumby's iconic green face is now available on a small, lightweight fleece blanket (or throw). Fans are giving it a thumbs up. Chill and keep toasty at the same time with this small, lightweight fleece blanket (or throw). Unique and delicious, our giant Gumby gummy candy will satisfy the biggest sweet tooth. At 6" tall, and weighing in at one pound, there is enough to share. This green apple sensation is tangy and sweet... and oh so fun! Go ahead, play with your food. Ho Ho Ho! Deck the halls with this fun and flexible mini Gumby ornament. At just over 3" tall, this Gumby figure is bendable and posable. It also comes with a suction cup for easy mounting on glass or metal. Gumby Infant Snap Suit: "Bend There"
Bend There, Done That--a cheeky saying for your flexible little angel--is printed on a 100% pre-shrunk navy cotton snap suit. Gumby Infant Snap Suit: "Fun and Flexible"
Your fun and flexible little one will be adorable in this Gumby infant snap suit. The cheery image is printed on a 100% pre-shrunk light blue cotton snap suit.